The Pacific War Online Encyclopedia: Ginder, Samuel P.
NavSource.org. Fair use may apply. "Cy" Ginder was an early Navy aviator who participated in the International and Schneider Cup air races in 1925. He commanded Enterprise in mid-1943 before being promoted to command of a carrier task group, Task Group 58.4, during the Marshalls campaign. However, in March 1944, Ginder's chief of staff was killed in an air accident. Ginder, who till then was considered a first-rate officer, suffered a mental breakdown as a result, remaining in his cabin and showing interest only in editing the ship's newspaper. 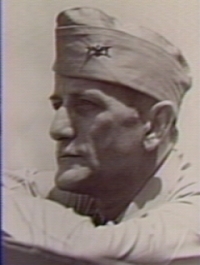 Mitscher was forced to replace him with "Jocko" Clark in April 1944.